Andrew J. Policano is the Dean’s Leadership Circle Endowed Professor and Academic Director of the Center for Investment and Wealth Management (CIWM) at The Paul Merage School of Business, UC Irvine. Policano served as dean of the Merage School from 2004 to 2013. During his tenure, the School received over $60 million in pledges, hired over 20 faculty members, created five new degree programs, established 11 new chairs/professorships and broke ground on a new business school building. Highly recognized, the Merage School consistently ranks among the top 5-10% of accredited business schools in the world. In 2009, reports in BusinessWeek, Financial Times and US News placed the Merage School at number 1 in the U.S. for percentage of students employed at 90 days after graduation. 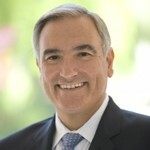 Prior to arriving at UC Irvine, Policano was Dean of the School of Business for ten years at the University of Wisconsin, Madison. During his tenure, the school created several new degree programs, built two new buildings and through successful fundraising efforts, the School’s endowment increased from about $6 million to over $90 million. Policano received his doctorate from Brown University in economics, and his work in macroeconomics has been widely published. He has also published numerous papers on higher education and media rankings and recently completed a provocative book on public higher education, Public No More: A New Path to Excellence for America’s Public Universities, co-authored by Gary Fethke. He is currently working on a new book entitled Climbing the Ivory Tower: Strategies for Academic Leadership in Turbulent Times. Policano serves on the Board of Directors of two public companies, and he is an active member of the community. He is a member of the Investment Committee of the Orange County Community Foundation and a member of the Board of Directors for OCTANe. He is past Chair of the Board of Directors of AACSB International and has served on the Board of Directors of the Graduate Management Admissions Council. In 2011, Policano was inducted into the inaugural Hall of Fame for the PhD Project for his work helping to increase the number of PhD candidates and the number of business school faculty from underrepresented groups by over 400%. Policano was recently awarded the Dean’s Leadership Circle Professorship at the Merage School for his many contributions to the school and university.